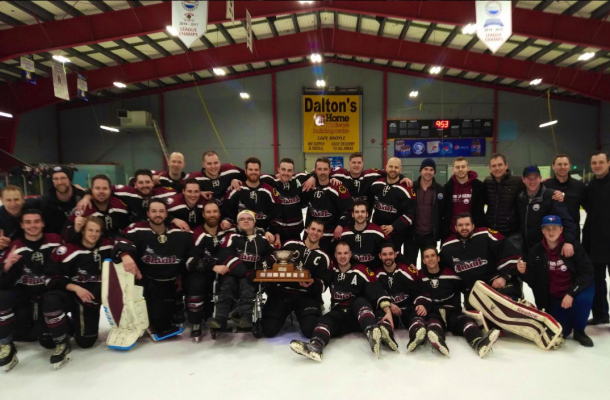 The Southern Shore Breakers were victorious over the Clarenville Caribous, sweeping the series and giving them a berth in the Herder Memorial Championship game. Michael Chafe’s second goal of the game came in overtime, gave the Breakers the win & put them on the road to the Herder Championship against the Grand Falls-Windsor Cataracts. The Breakers completed their Eastern Division final, beating the Clarenville Carious 4-3 to complete a four-game sweep at the Southern Shore Arena. The Breakers headed into the playoffs after finishing third in the East during the regular season 9-10 record. The Caribous were first in the East at 14-4-2. In facing the Cataracts, the breakers will be facing a rested team. The Cataracts have been sitting idle for the past week after wrapping up their Central Division final with a 4-2 series win over the Gander Flyers. For the Breakers, goals came from Michael Chafe, Daniel Cadigan and Daniel Aylward. Chris Sparkes had two goals for the Caribous, and Chad Earle scored once. The Shore grabbed a 3-0 series lead Friday night, beating the Clarenville Caribous 6-4 at the Eastlink Events Centre, sending the game back to the Breakers’ home ice. In that game, the Breakers’ Keenan Kennedy potted the game-winning goal and added an insurance marker, while teammate Scott McCarthy scored the game’s opening two goals, giving the Shore a 2-0 lead after 20 minutes. Matthew Oates and Brandon Baird also scored for the winners.